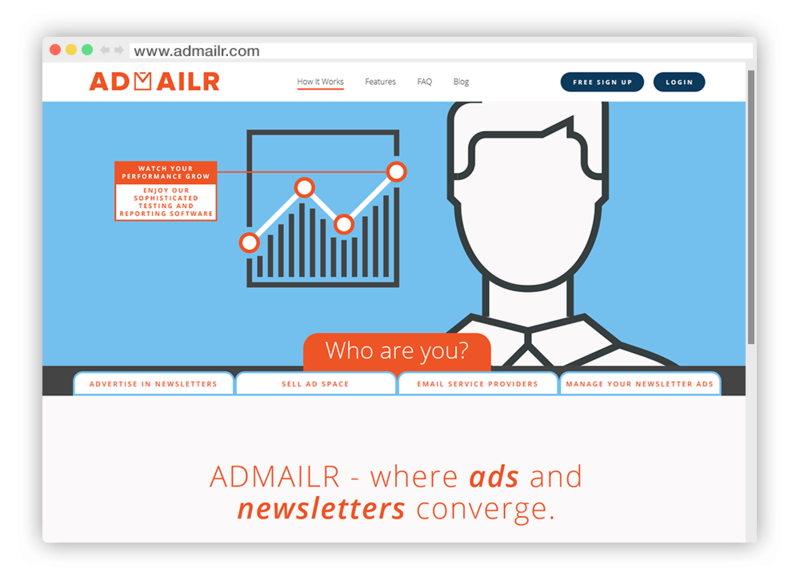 Admailr has been an active advertising network since 2013. A lot has changed since then. This is an updated review for December 2016. Are you a publisher seeking to monetize your email newsletters? You can actually serve ads from Admailr in your email newsletter and earn a good income in return. So what is Admailr? Admailr is an ad network established in 2013. The ad network provides a simple to use platform that gives publishers the ability to monetize their email newsletters with native and display ads. It is basically an email display advertising company specializing in native ads as well as targeted display advertising within the content of an email sent by the publisher to his or her list of subscribers. Each subscriber of the newsletter will see different ads based on their interests. The network uses a CPM + CPC pricing model for its publishers. If you have a large but well-targeted email list, this is a great network to join. They bring together advertisers seeking to reach their targeted market with publishers seeking to monetize their email newsletters. What prompted the formation of Admailr? The idea to form an email newsletter advertising network was born out of the frustrations most mailers with email lists faced when they sent offers to their subscribers only to have the emails blocked by stringent Internet Service Providers (ISPs). Many ISPs would even block accounts that sent too many offers to their subscribers. In most cases, the offers being sent never reached the inbox or were simply deleted. To say the least, inbox delivery was at its lowest in comparison with the early days of email marketing. Poor inbox delivery was a major pain for most internet marketers. Many publishers who were sending out newsletters with valuable content were searching for a way to not only reduce mailing costs but also monetize this valuable content they were providing their readers. This is the reason why Admailr was founded, to help publishers with email newsletter audiences monetize their valuable content with highly relevant ad content and for those that are fortunate enough to already have partnerships with advertisers the ability for them to get better control of their ad targeting. 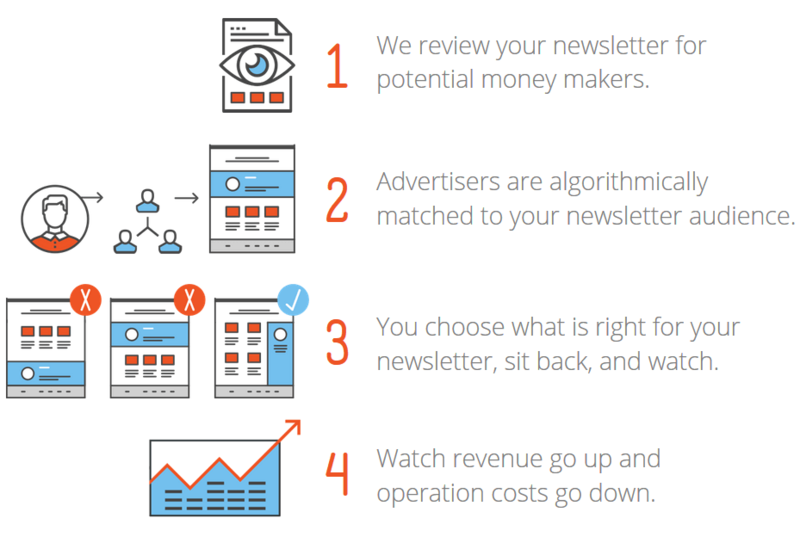 The network helps publishers monetize their email newsletters with customized ads. Want an ad network review similar to this one? Getting started as an Admailr publisher is quite easy. You need to first sign up at the application page of their website, fill all the necessary details including your mailing address and tax information. You’ll be required to verify or confirm the details. Admailr will then review your newsletter and show you potential money makers in the newsletter. They’ll then match your subscribers with the best advertisers. This is done algorithmically to match the subscribers with the most targeted advertisement. As a publisher, you still have the option to choose which ad categories you want to be served in your newsletter. Once you have selected the categories, all that remains is to sit back and watch your revenue grow at the lowest operation costs. Admailr allows publishers to manage ads in their newsletters. You can leave your newsletter the way it is and retain your current advertisers. Advertisers select where to place ads on your newsletters based on your audience demographic, and the number of viewers they need to send their ads to. Advertisers also choose specific time frames that fit their budgets. Everything is done accurately and professionally to provide the best results for both advertisers and publishers. You’ll never see glitch ads or links that don’t work at Admailr. All the ads in your newsletter run smoothly. Your readers are also served with ads that are relevant to them. Admailr has a high minimum payment threshold of $100. They pay on a monthly basis as long as you have reached the minimum payment limit of $100. All in all, this is a great network for publishers with large volumes of email traffic. What we like most about Admailr: They provide a cost effective way to monetize email traffic via newsletters, have an easy to use interface, connects you with the best advertisers, high CPM rates, and timely payments. They accept publishers globally. What we liked least about Admailr: High minimum payment threshold of $100, no weekly payments, they don’t pay via PayPal unless on request, limited payment methods, time-consuming application method which includes verifying your address via PIN although you can still start monetizing your newsletter and generating revenue without verifying your address. Employee count: 11-50 employees as of December 2016. Admailr supports Native ads and display ads. They specialize in email newsletter advertising. All you need to do is submit your newsletter to Admailr and they’ll connect your subscribers with the most relevant advertisements. Being an email advertising network, their ads are suitable for both mobile and desktop platforms. They use an implementation technology that encompasses an HTML tag. You can track the performance of your campaigns easily via the reports page. They use an in-house proprietary platform to track and monitor campaigns. Setting up a customized campaign at Admailr is quite easy. You first need to choose the right category to display your ads via the Category Management page. Choose CUSTOMIZED then CATEGORY and pick the categories that are relevant to your newsletter. Customize where you can customize your newsletter, advertisements, and much more. Publishers can check their earnings via the Dashboard Overview. You’ll find a summary of your earnings from the previous month to present in Estimated Earnings and your current balance which is ready for withdrawal is shown in the Finalized Earnings section. You can click this tab for more details about your payout status. Compared to other networks, Admailr has a rather limited number of payment methods. They don’t have PayPal but on their FAQ page, they indicated that you can request to have your payment sent to PayPal via your account manager. Their minimum payout threshold is also a bit high at $100. However, they give timely payments each month and are quite reliable too. Do you own an ad network? Do you want use to review it, similar to this review? Admailr is a good company with the best way of monetizing your email newsletter but they need to do something about their limited payment methods. There are numerous companies out there who use e-newsletters to reach their targeted audience. While some are doing a great job, most have very low open and clickthrough rates. If you want to succeed in email newsletter marketing, you need to align yourself with the most professional companies in this field. Admailr is a perfect example of an ad network that specializes in e-newsletter marketing via email. The network was founded in 2013 to provide a simple yet effective platform for publishers to monetize their email newsletters with relevant display ads from the best-paying advertisers. Admailr is basically an email display advertising network which specializes in headline email ads and targeted display within the content of the email. The network offers a CPM pricing model for publishers. This is a great network for those with large email traffic because it brings together advertisers seeking targeted newsletter traffic with publishers seeking to monetize their e-newsletters with the best offers. Another great advantage of using Admailr platform is the fact that publishers can manage the ads featured in their newsletters. You can choose to leave everything in your newsletter as it is and retain the advertisers you have. Every aspect is done professionally at Admailr to ensure both advertisers and publishers have the best deal possible. You won’t find glitch ads or dead links in your newsletter. The ads and links run smoothly without a hitch and your readers are served ads that are relevant to their interests. Let us review your ad network on this ad network review directory, similar to this one. As a publisher, you stand to gain a lot when you join this ad network. They will help you bring credibility to your email newsletter when you serve premium ads. You are able to maximize the value of your newsletter content with ads from top companies, get the maximum value from your subscribers, and help you to monetize an unused space in your newsletter with relevant ads. Above all, Admailr lets you focus on your mailing while they take care of finding advertising partners for you. Despite the few setbacks such as the $100 minimum payout and no weekly payments, this is a great network because it allows you to tap into email traffic in a more professional way. When sending offers directly to your email subscribers is no longer viable, you’ll need to incorporate ads in your newsletter in a more professional way. That is exactly what Admailr provides.